Life, if we let it, can become a pressure cooker. We never seem satisfied by what we have or where we’ve gotten. There’s one more rung on the ladder to climb, one more recognition we think we deserve, one more promotion or accolade. Some of us — sometimes it seems like our entire popular culture — are like characters in a video game or reality show, dodging challenges as we graduate to the next level of play. But where is it we have arrived when all is said and done? Sometimes answers come in very small packages, like short stories or novels. 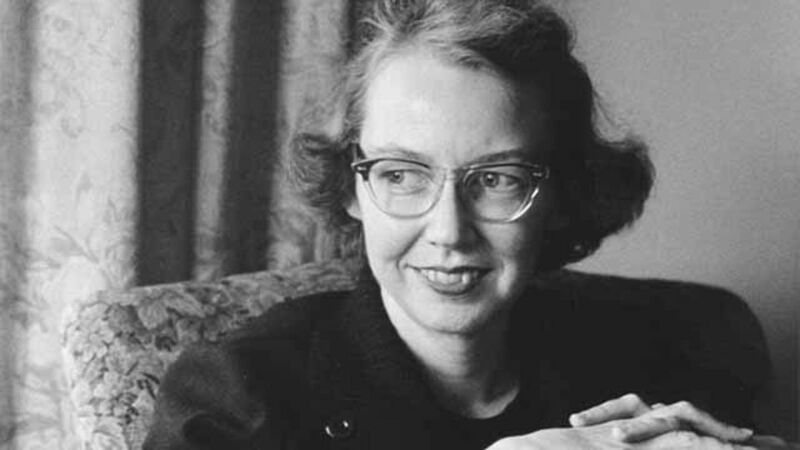 The art of Georgia writer Flannery O’Connor lies in her ability to condense the heaviest of thoughts about life and purpose into the commonplace of stories. In 2015 the U.S. Postal Service issued a Flannery O’Connor “Forever” postage stamp. It is an occasion well worth noting, not only for the literary world but also for the reason that many others now will discover and read her for the first time. Usually described as “Southern Gothic,” O’Connor’s stories are sometimes viewed as a regional flowering of the post-World War II era, or as a chapter in a 20th-century Catholic intellectual movement that included such world-class figures as Dorothy Day, the French writers Simone Weil and Teilhard de Chardin (paleontologist and priest), and Louisiana novelist Walker Percy (he and O’Connor were friends). There is urgency in O’Connor’s faith and fiction. She believed “everything works toward its true end or away from it, everything is ultimately saved or lost.” Life is a deadly business, and the fate of one’s soul is the driving force in her stories and novellas. We do not arrive on this earth ready-made and “good.” Humankind’s embedded egoism and delusions constantly conspire to blind us to the truth of things. Awakening us was her mission, and those literary darts dipped in the odd and the ugly were her weapons. Humanity’s only true refuge is in the divine. Born in Savannah in 1925, O’Connor moved with her family at the age of 12 to Milledgeville, her mother’s hometown. Her father, the most important figure in her early life, suffered from lupus so debilitating that work became increasingly difficult. He died when she was 15. O’Connor was drawn to stories and the printed word as a child. While a student at Milledgeville’s Georgia College for Women (today, Georgia College and State University), she experimented with cartooning in the campus newspaper, drawing from (it must be said) a delightfully warped humor to convey the truth she saw behind the most ordinary of things. A shy person but not without friends, she headed “north” (her words) after graduation to the University of Iowa, where she eventually settled into the now world-famous Writers’ Workshop. Thus begins the opening chapter of a career wholly dedicated to the art and craft of literature, ending only with her premature death from lupus at age 39. The author of the short-story collection A Good Man Is Hard to Find and the novels Wise Blood and The Violent Bear It Away, O’Connor had but a brief presence on the national literary scene. Yet she won early recognition and in some circles fame as a writer whose themes mined the depths of her Catholicism in her own “Christ-haunted” land. She was in much demand as a speaker, but her illness mostly prevented travel. To have achieved such literary prestige based on such a substantial yet slim body of work before her death is pretty remarkable for any time and place. My favorite story, and the last she wrote, is “Parker’s Back.” Parker is something of a drifter in life, unhappily married and working at odd jobs for country neighbors. He saves his money for the pool hall and another tattoo (his body is covered with them). The most important tattoo of all, the one that holds the key to his fate, is on his back. Out of his sight, it follows him wherever he goes (the tattoo is an image of a “Byzantine Christ” with “all-demanding eyes”). The story concludes with a convulsive and tearful confrontation that brings Parker to his knees, hinting finally at the possibility of union, of wholeness as a new day breaks. The grotesque elements of her stories, set mostly in the rural South, seem to distance her fictional world from the reader. But one can say that too of other great writers, like Dostoevsky or George Eliot or Herman Melville. How will she be received by a new audience in a 21st-century world of lightning-speed communication that chops up our stories and etherizes “place” — the very things that make her work so potent? Don’t be surprised at a Flannery O’Connor boomlet, or maybe even a revival. She would be alternately amused and appalled by that, I expect, for it was the forever that she cared most about.